This week series of storms took us on rolling coaster ride with many ups and downs; from rain to snow and back to snow, from two days of epic skiing at Bogus having fun brought to a halt due to power outages that shut down the resort two different days, and Idaho 21 closed due to avalanche danger above Idaho City. For many of us, it was heartbreaking not being able to make it to Mores Creek Summit (MCS). The road above Idaho City was closed. Up to the point when this post was posted, the road remains closed according to the Idaho Transp[ortation department website. So, with no road access to MCS, it was logical to hit the slopes at Bogus Basin. Skiing was fantastic on Tuesday and Wednesday, until on both days almost at the same time, around noon, the power went out. Auxiliary power was used to get skiers out of chair lifts but the mountain was closed for skiing. BUMMER! 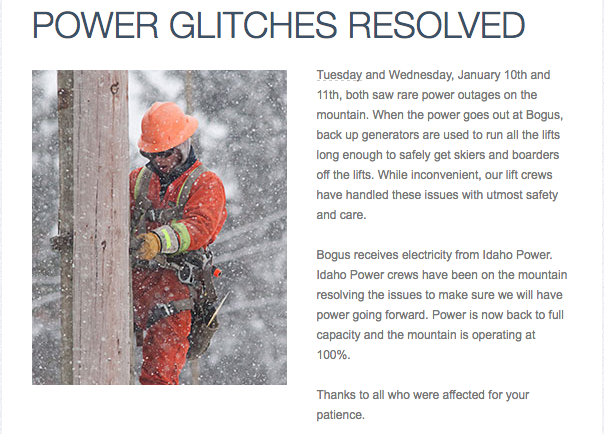 Bogus Basin announcement to the public about power outages in the Ski Resort. Storms added 15 cm of SWE to Bogus Basin snowpack and more half a meter of snow. 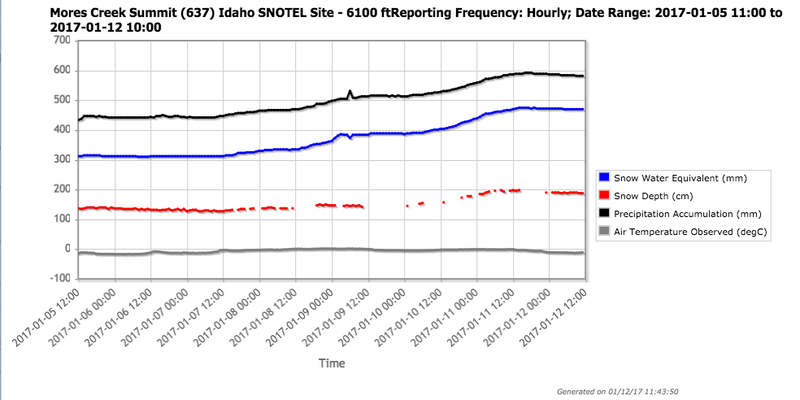 A carefully review the SNOTEL data shows the high variability of densities of the precipitated snow due to winds and temperature variations. The next chart shows the snow height at Bogus Basin SNOTEL with selected densities calculated for 6 hour periods. The skiing at Bogus Tuesday morning can only be described as EPIC! Snow with 7% density capping a progressive early storm layer of 11.6% density, made riding fast and smooth. On my first turn that stormy morning while dropping from War Eagle cat track into a untracked run produced my first massive face shot of the season. At that moment I knew it was going to be AWSOME! When I was stuck in the chairlift for 15 minutes or so, I did not know about the power outage. Once they start running the lifts on auxiliary power, at the top ski patrollers were communicating the heartbreaking news. Snow continued to fall after the resort closed on Tuesday. Wednesday skiing was deep, big boards were a most. Wednesday skiing was tricky due to the upside down conditions. It was important to stay afloat and avoid getting trapped in the deeper lighter snow. As it can be seen in the chart above, there were two layers of lower density snow sandwiched with higher density. But it would not matter. After close to two of hours of skiing, the resort experienced it second power outage of the week. 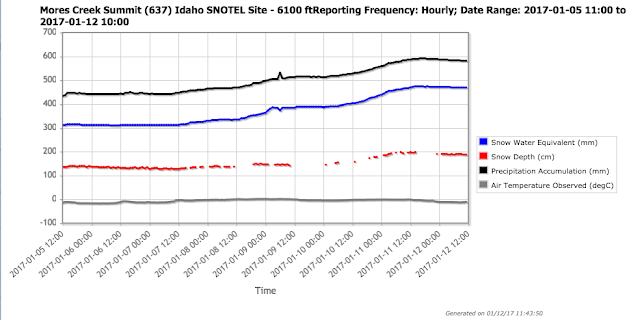 MCS SNOTEL shows also a significant gain, with approximately 2 meters of snow at the pass. 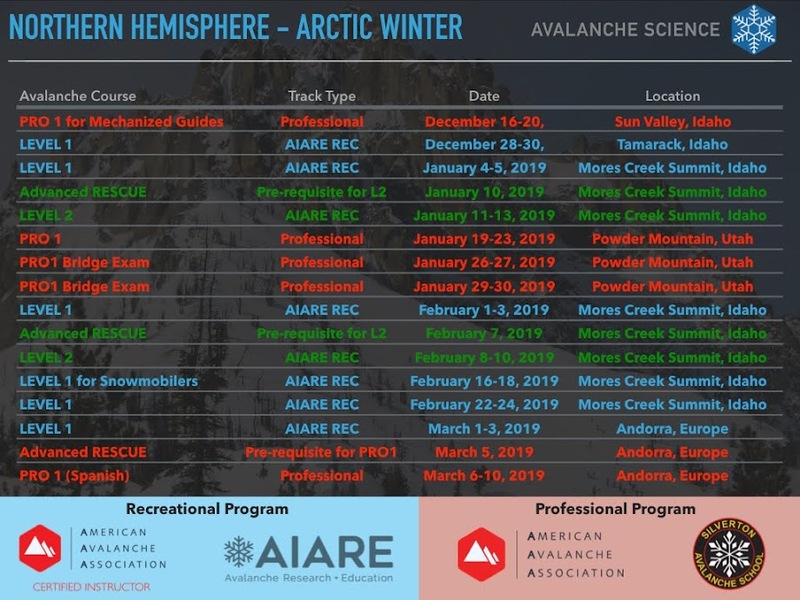 Soon I21 north of Idaho City should be opening, and we will get to ski MCS, and share pics of conditions, and identify avalanches that might have affected the roadway, as well as an idea of what backcountry skiing runs released during the storms. 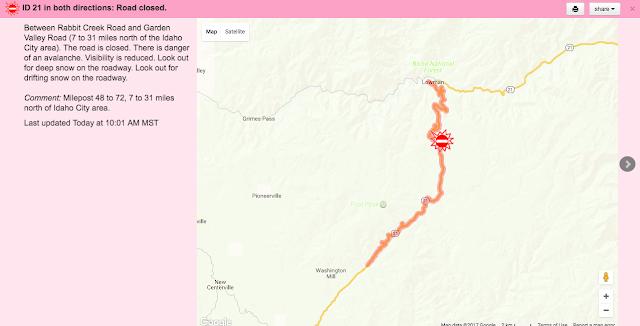 As of this Friday morning, IDT 511 web-based report for Idaho 21 north of Idaho City indicates that it remains closed. In other words, there is no access to Mores Creek Summit. This is very unusual for this roadway segment. The Idaho Statesman also reported on the impacted of I21 closure Idaho 21 closure cuts off access to skiing, snowshoeing, snowmobiling near Idaho City.